Jack Roeder and Steve James at the WCRF fall awards banquet. On the evening of Wednesday, November 14th, the Washington County Riverboat Foundation (WCRF) held their Fall 2018 awards ceremony at the Riverside Casino and Hotel. 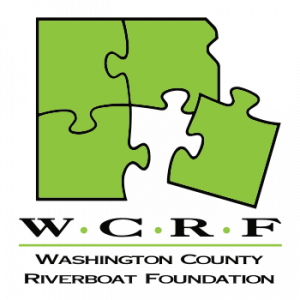 The WCRF Fall 2018 awards are through their Competitive Grant program. Prospect Meadows was one of 41 groups to receive funding from the WCRF. All told, the WCRF handed out over $1 million in awards to the groups in attendance on Wednesday. Prospect Meadows received a grant of $56,491 to fund half the cost to install a state-of-the-art playing surface on the Miracle Field at Prospect Meadows. We can’t thank the WCRF enough for their consideration and support of the Miracle Field project! The Miracle Field is specially designed for differently-abled children to play baseball in a safe and inclusive environment. The playing surface is a cushioned, rubberized surface to prevent injuries and also provides a smooth surface for easy wheelchair access. 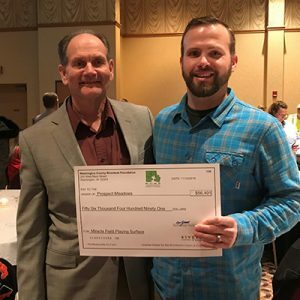 The Washington County Riverboat Foundation is pleased to be a significant part of helping non-profit organizations and local government to complete important projects to make Washington County, and the surrounding communities a better place to live and work. The Washington County Riverboat Foundation (WCRF) is the 501c(4) non-profit affiliate and gaming license holder for the Riverside Casino and Golf Resort. Through the Competitive Fund, the WCRF Board of Directors distributes 75% of the annual donations it receives from the Riverside Casino and Golf Resort in the form of grants.